When the standoff in Doklam began, the Chinese establishment threatened us with war everywhere from Kashmir to Uttarakhand to Sikkim to Arunachal. The Global Times began a daily ritual where this or that Chinese “expert” would rant about China’s overwhelming military superiority. One of the more comical lows was reached when another Chinese “expert” warned of a “small scale military operation within two weeks” in which they would seize Indian soldiers in Doklam. The “expert” even went on to say that the Chinese government would inform the Indian Foreign Ministry before the operation. One wonders how the “expert” forgot to give us the exact date and hour of the attack. It is difficult to take such troll posts seriously for too long. For a while now, the Chinese have been remarkably insecure about India, overreacting to the smallest things. For instance, nobody in India would have even noticed that a recent NASA image made India look brighter than China. That is unless the People’s Daily (official mouthpiece of the Communist Party) went out of its way to assure the Chinese people that their country has more electricity than India does! What makes these tantrums look comical is that most Indians already concede readily the massive economic and military edge that China enjoys over India. Instead of speaking like the hefty superpower that most Indians perceive China to be, why is China reduced to speaking like Zaid Hamid? I swear to God that some of those Global Times “editorials” were one step away from threatening “Ghazwa-e-Hind” and promising to establish “Radio China Delhi”. If I remember correctly, that guy was considered too embarrassing even for Pakistan television after a while. It is anyone’s guess why China wants to speak in a manner that would leave even Pakistanis squirming. After threatening to blow India to bits, the Chinese finally attacked … with stones! The supposedly professional army of a wannabe superpower reduced to the modus operandi of common terrorists and common criminals? Was this planned or plain indiscipline in the ranks of the Chinese Army? I am almost embarrassed for the Chinese here. So the Chinese tried it all : from childish threats to troll posts on the internet to pelting stones. You know they are out of ideas when they made this painfully stupid video. No real response is needed to this one, because the Chinese themselves have done a fantastic job of turning themselves into a worldwide laughing stock. Aware of the PR disaster with the first video, the Chinese came back with a second video which they feel will finally turn the tide for the ‘heroic’ PLA. All this while, India has stood calm and sober. Unwilling to be drawn into silly verbal clashes about whose daddy is stronger. The Chinese have been reduced from threatening war to small scale military operation within two weeks… to making racist videos. India’s determination has reduced China to the level of a Twitter troll. This just in : The second video seems to have failed as well in shaking India’s determination. Imagine that! 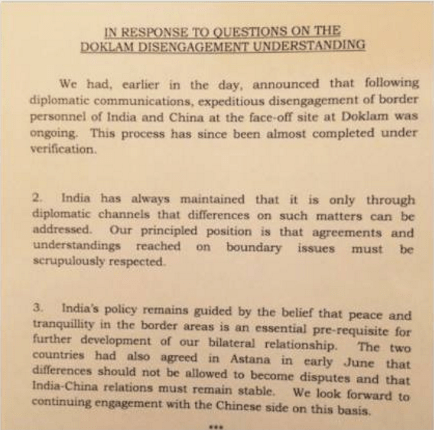 Disengagement of border personnel of India AND China. After promising to make war on us everywhere from Ladakh to Arunachal to Sikkim to Andamans … perhaps all the way to the Moon and Mars. It is now for the Chinese government to explain to their people how they and their ‘heroic’ PLA fought like valiant Twitter trolls, only to fold up having to make “necessary changes”. Oh, one more thing. With Doklam successfully demilitarized, a small group back home in India has lost face as well. I will not name them, because they know well in their hearts who they are. But they are welcome, as always, to celebrate our national achievement.